Cnut was a Viking who became the king of England in 1016. 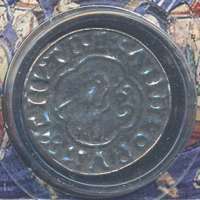 The original coin would have been struck in Lincoln between 1017-1023. The term Viking is used to refer to the Scandinavian explorers, warriors, merchants, and pirates who raided, traded, and settled in wide areas of Europe and the North Atlantic islands. 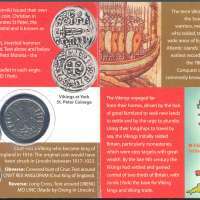 The period from the earliest recorded raids in Britain in the 780’s until the Norman Conquest of England in 1066 is commonly known as the Viking Age. The Vikings voyaged far from their homes, driven by the lack of good farmland to seek new lands to settle and by the urge to plunder. Using their longships to travel by sea, the Vikings initially raided Britain, particularly monasteries, which were easy targets with great wealth. 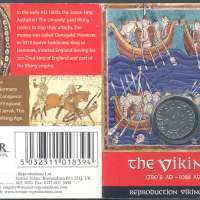 By the late 9th century the Vikings has settled and gained control of two thirds of Britain, with Jorvik (York) the base for Viking kings and Viking trade. In the early AD 1000s, the Saxon king Aethelred ‘The Unready’ paid Viking raiders to stop their attacks. This money was called ‘Danegeld’. However, in 1013 Sweyn Forkbeard, King of Denmark, invaded England leaving his son Cnut king of England and part of the Viking empire. In 1066 England was conquered by the Normans under William, The Conqueror. They took over all of England and in 1069 burned Jorvik. This was the end of the Viking Age. The Anglo-Saxons did not have realistic portraits on their coins in the way that we are used to today. Almost all of the busts that appear on Anglo-Saxon coins are fairly crude copies of Roman coin designs. They tended to copy designs of the late third to early fifth centuries, even though their own coins were being produced several hundred years later. There are a few exceptions to this. The first king of England to introduce a more contemporary style of bust was Cnut (AD 1016-35). Cnut conquered England with an army of Vikings, and shortly afterwards became king of Denmark as well. In 1030 he also became king of Norway. Cnut took over the Anglo-Saxon system of coinage, but two of his three English coin types depart from traditional sub-Roman images. His first type shows him in a crown similar to those pictured in Anglo-Saxon manuscripts of the same period. His second type shows him wearing a helmet. This is a typical helmet of the type worn by Anglo-Saxons, Normans and Vikings in the eleventh century. Contrary to the popular myth about Viking helmets, they had no horns. This reproduction Cnut Penny coin is made from lead-free pewter. 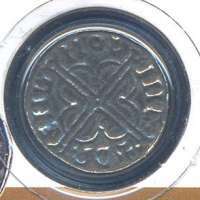 The coin has the crowned bust of Cnut on the obverse and a long cross on the reverse. 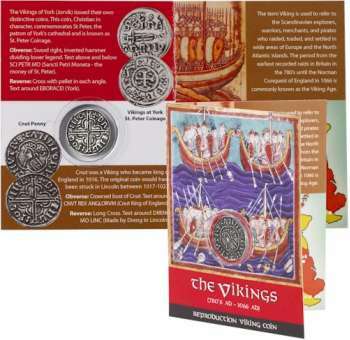 The coin is held in a clear plastic blister and is supplied in full colour pamphlet style packaging, complete with images and historical information of both the coin and the Vikings. By Westair Reproductions Ltd, Birmingham. Bought during a visit to Viking Ship Museum, Roskilde, Denmark for Kr. 20 (around £2.20) in April 2012.